I stumbled upon an amazing treat in St. Helena, California after applying for a position at Clif Bar this past week. 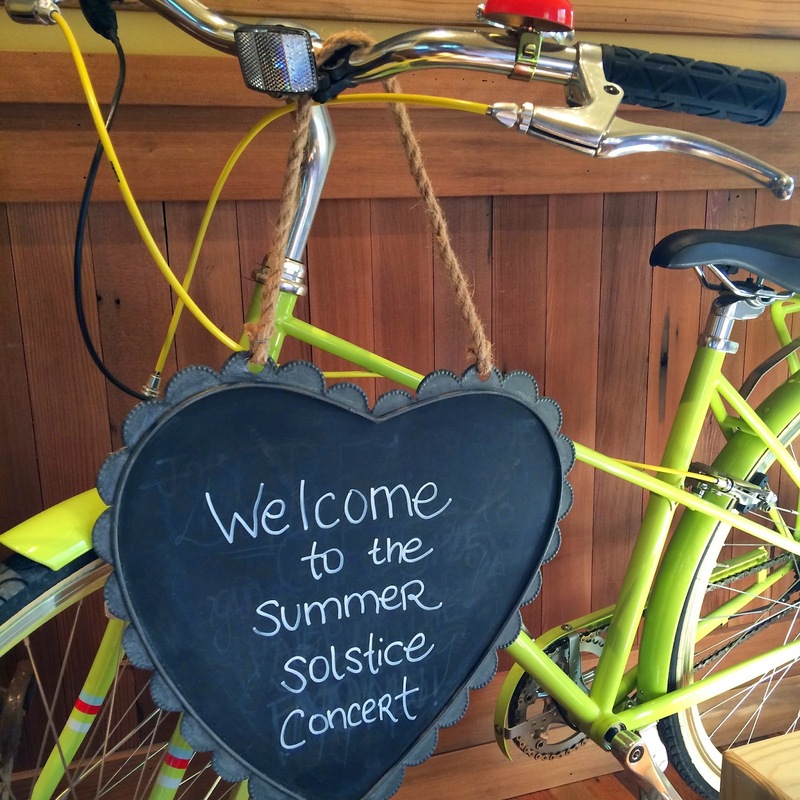 As I was browsing the Clif Bar website to get a better feel for the company branding and their mission, I took a chance and bought a single ticket for their "Summer Solstice Concert". It mentioned that the band was made up entirely of Clif Bar employees. I thought, "What a great way to find out if I like these people and this culture". 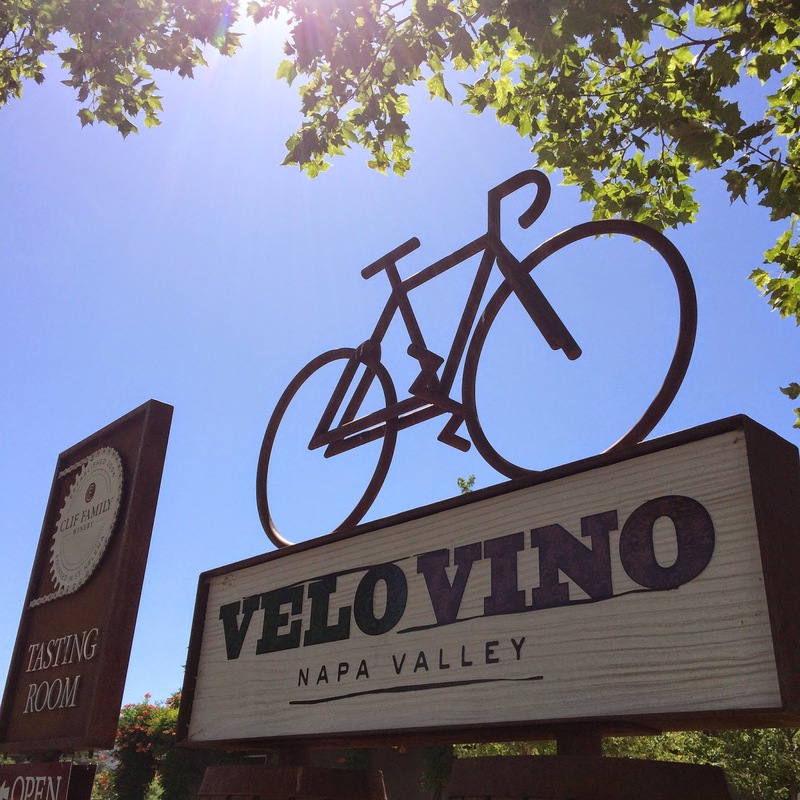 So, I loaded my road bike into the car and ventured off to Napa Valley. Kit Crawford and Gary Erickson really have created a special place of solace for cyclists with this spot. 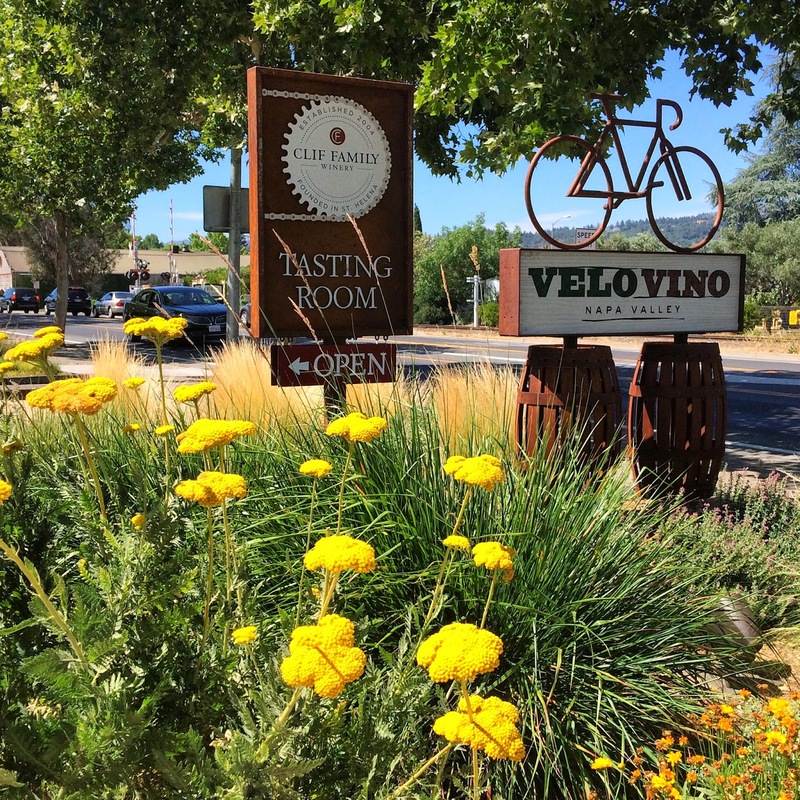 From the moment I stepped into Velo Vino ("bike" in French + "wine" in Italian), located at 709 Main Street on Route 29 in St. Helena, I felt a sense of family, history and cycling. Gary's bike "Fred", an Italian bike, shares the story of his life in pictures and display, where you can learn about Gary's cycling past in Italy. 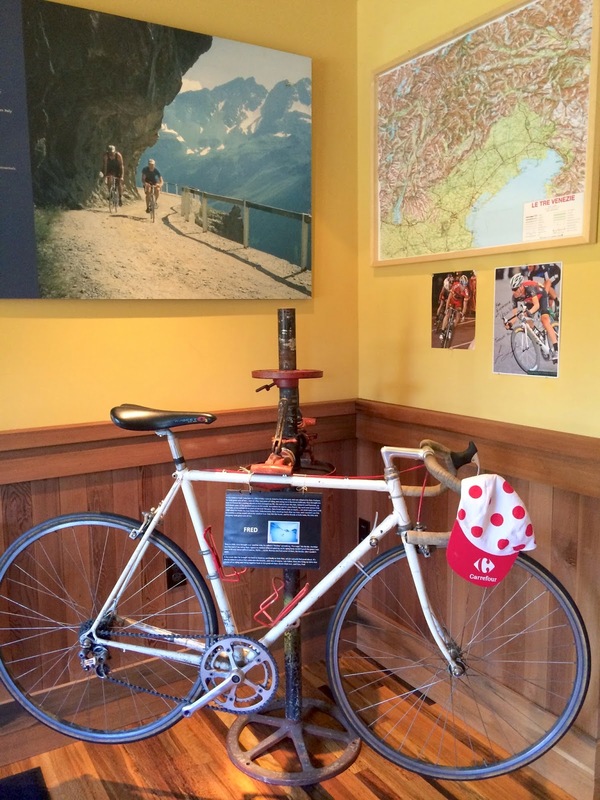 Pictures and bikes are carefully displayed in each corner of the space, with attention to detail and layout. Artfully displayed cycling books, cook books, jewelry, bike coloring books, and bike clothing are also available. Each item selected has a sense of quality; unique and special gift choices vs a "cycling shop feel". 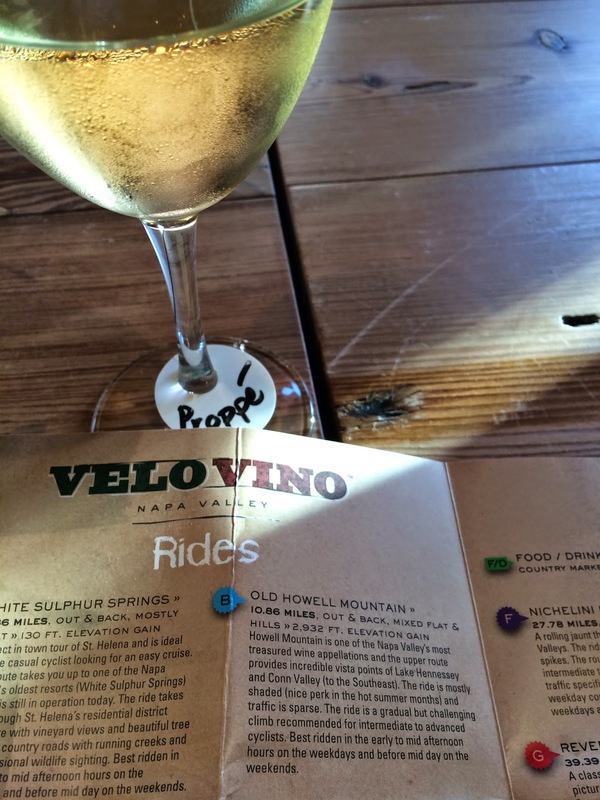 The friendly staff in lime green t-shirts welcomed me when I approached them, shared info about the tasting room, and provided me with a free cycling map so I could go for a ride before the evening event. 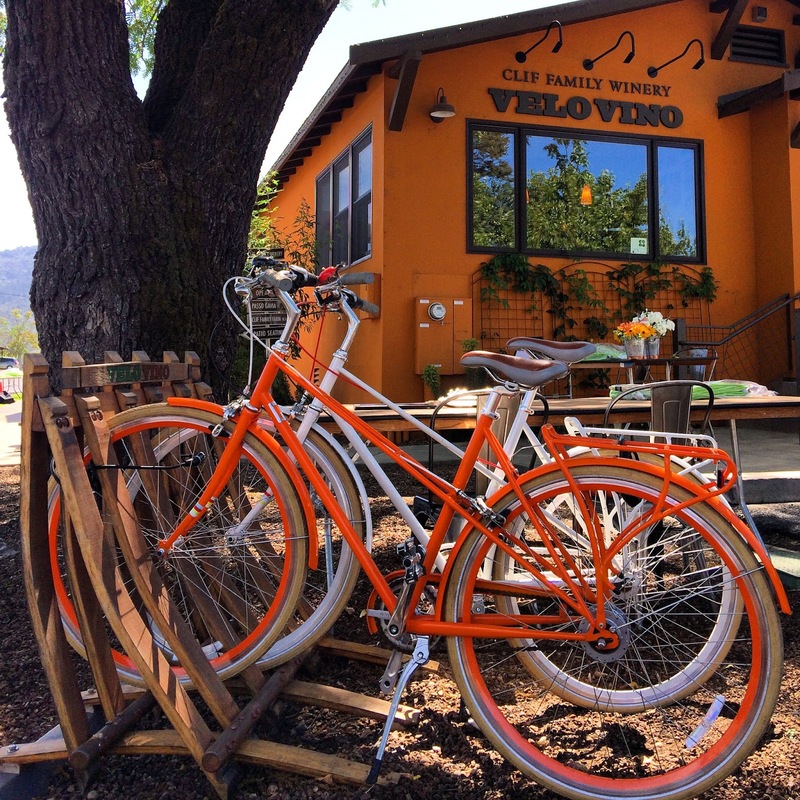 There are group rides on weekend mornings that set off from VeloVino, where you can grab espresso drinks and load up on a full selection of Clif Bar products, including Kit's Organic Bars (my personal fav of late is the Lemon with Chia Seeds). Crossing route 29 from their tasting room, the map takes you through a quaint neighborhood, over the old stone "Pope Street Bridge", and across Route 128 and on to Howell Mtn. Road. 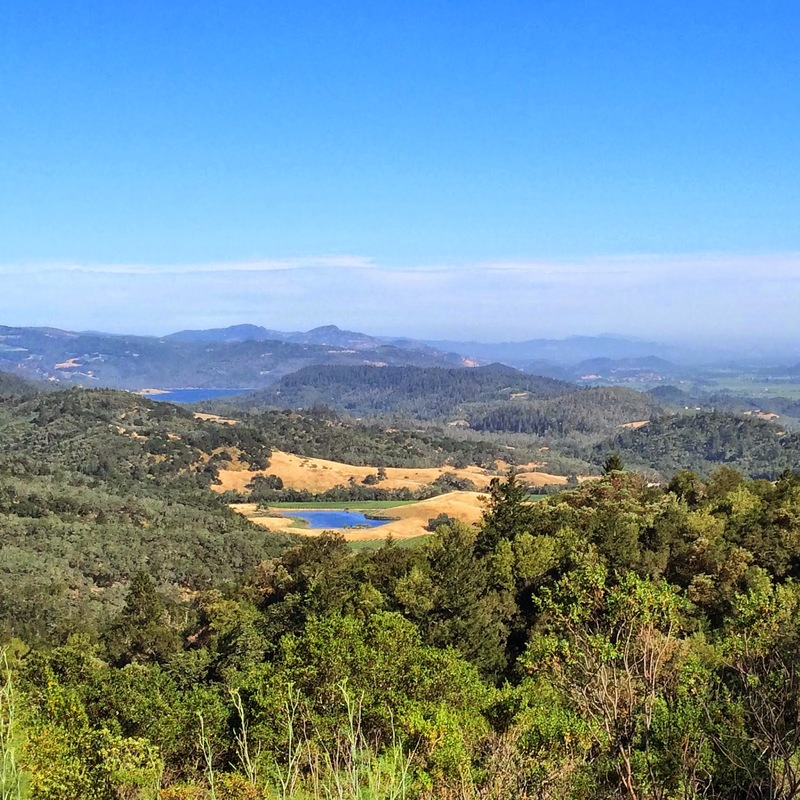 Once on Howell Mountain Road, you just climb. 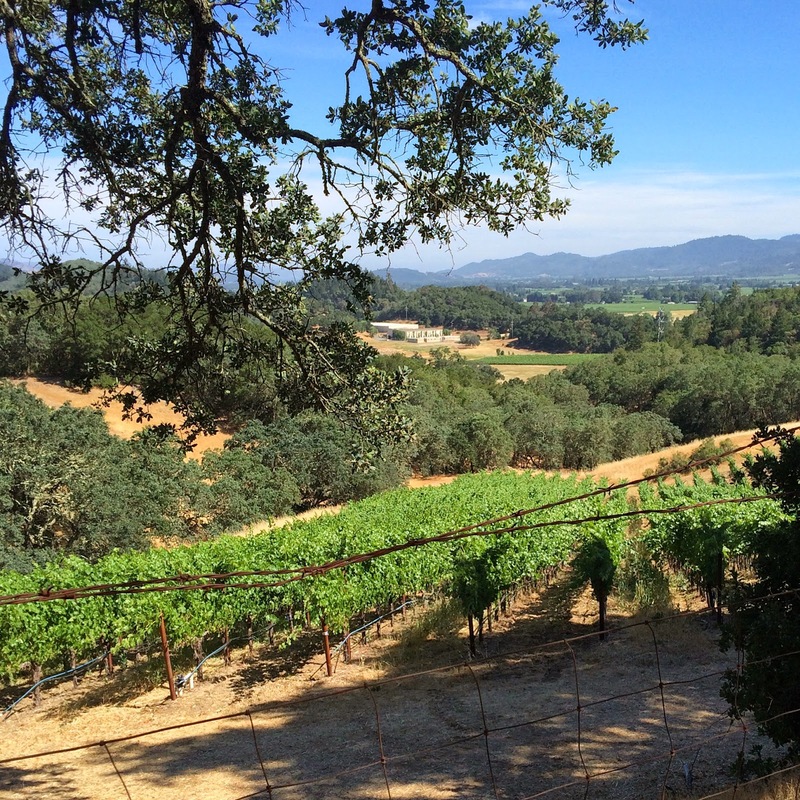 Climb, and climb, and climb... up through shady oaks, with views of vineyards in the distance. At the 2 mile mark, you intersect a road with many colorful signs. 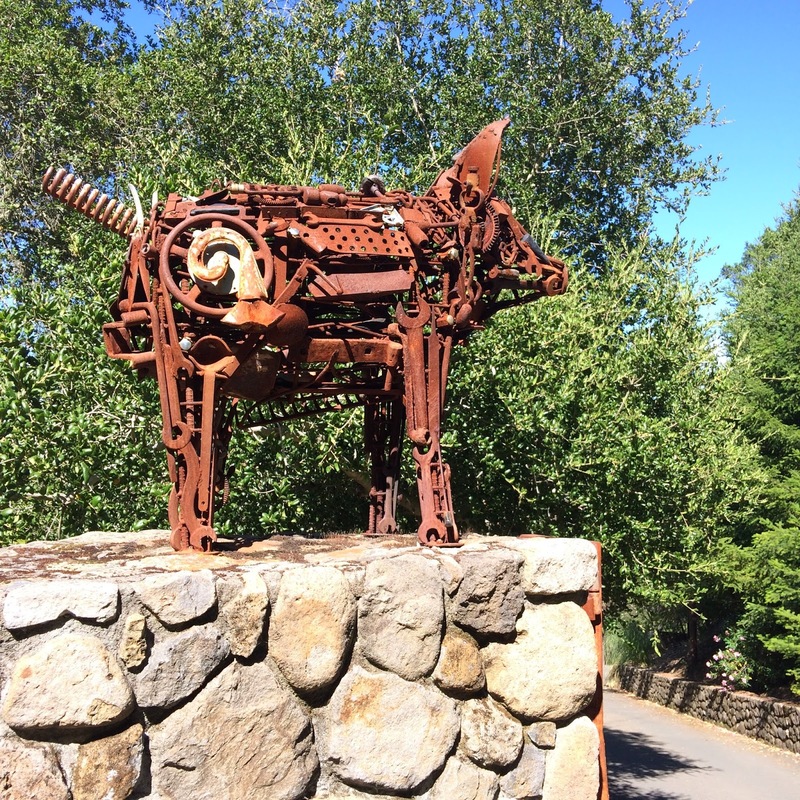 Another mile up or so, you pass a stone wall with a metal pig sculpture. The best part about this route is the shade and relative lack of traffic. I saw maybe two cars and a single bike the entire time I was on the road. It was a perfect workout and test of my road bike. I made it up to the 2,900 ft. intersection of Howell Mtn. Road/Deer Park Rd/White Cottage Rd. The vineyard was further up the road another 4 miles, but I'd run out of time. So, it was time to head back downhill to the concert. No complaints here. The decent was FAST! Like skiing. I loved it. I lowered my seat and learned how to take it easy on my breaks... It was really, really fun. Back at VeloVino, I was super excited for dinner. The tasting room has two HUGE bathrooms that are modern, clean and were perfect for freshening up and changing out of my bike clothes. For this event, a $10. food ticket provided many food choices and plenty of vegetarian options, as well as pork, chicken and fish at outdoor tents and a gourmet food truck near the music. Water and tables with fresh summer flowers were arranged right outside the tasting room in the back where the stage was set up for the band. 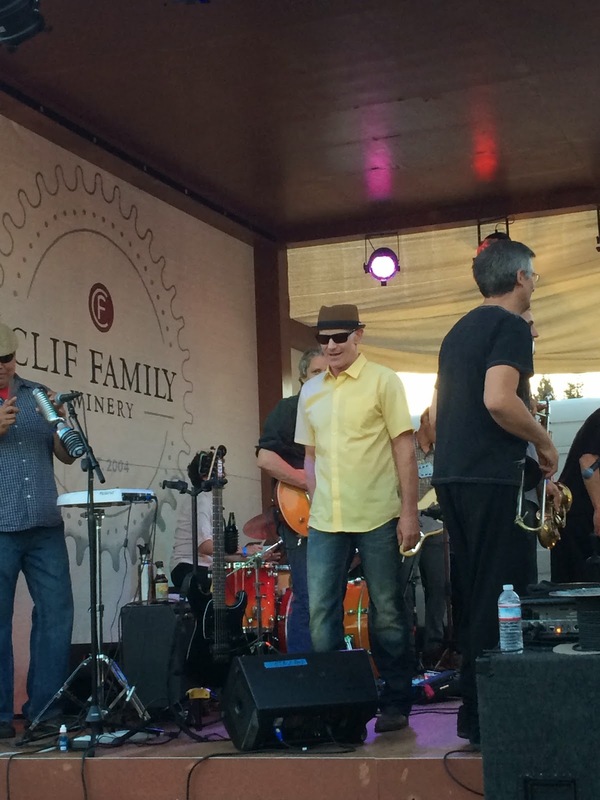 There are some nice photos of the event on the Clif Family Instagram page. I decided on a plate of 1/4 Wood Oven Chicken with Lemon-Basil Aioli, Heirloom Beans and Arugula. A wine glass was provided to each guest when we arrived in order for you to taste a variety of wines. I tried the perfectly cold 2012 Reisling, which was dry, but very refreshing, as well as a 2011 Petite Sirah. 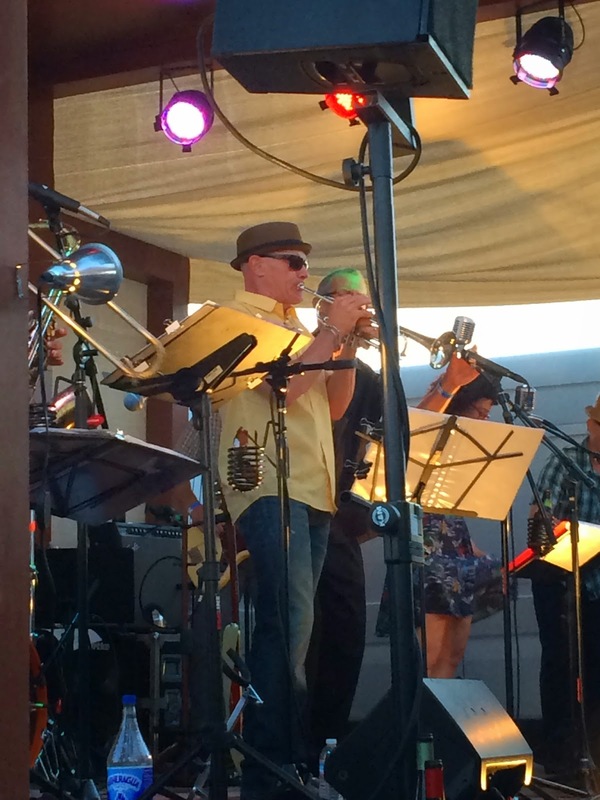 What I hadn't prepared for was meeting Kit Crawford and watching Gary Erickson right up on stage, belting out jazz trumpet like a true professional. All the players and singers were really talented. 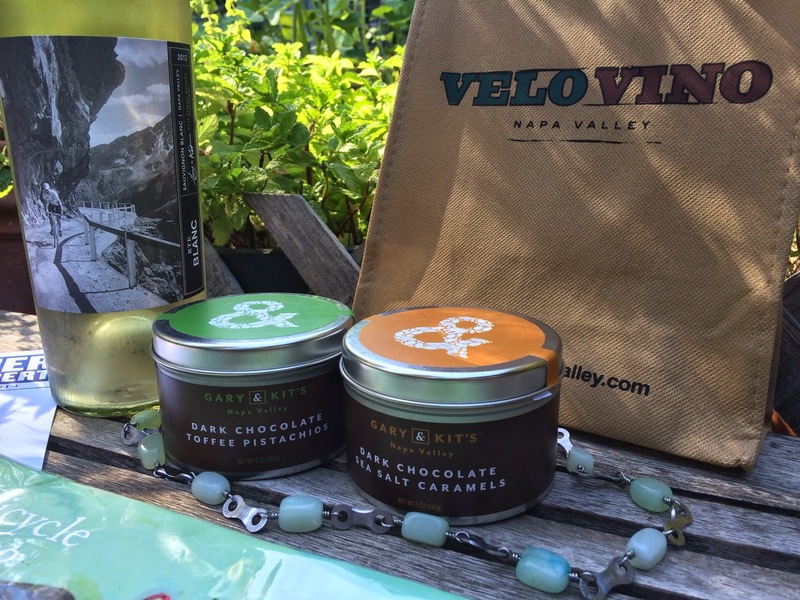 The couple looked just as the video of Velo Vino had portrayed them, and I told Kit how impressed I was with this event, and how welcome I felt. It really did feel like a family event that I had just stepped into as an invited guest. Every employee was helpful and kind, and we all danced together en masse to tunes provided by the Clif Bar Company Band until 10pm. At one point, the band announced that a woman down front had a Birthday- She had been dancing up a storm and I had noticed her artsy outfit; a black tunic with three brightly colored shapes at the bottom, and hot pink socks with black, Mary Jane-style shoes. She looked like a hip artist, but I never would have guessed she was turning 70! This goes to show what youthful attitude, Clif Family mission and exercise can do for you. I wondered if she was a Clif Bar employee. She was clearly awesome. In fact, I came away from this entire evening with a phenomenal feeling of wellness. 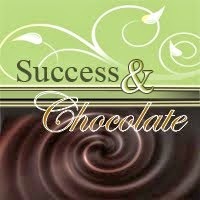 Kind, creative, passionate people with fantastic taste in food, display of product and marketing of brand. It wasn't at all forced or packaged. 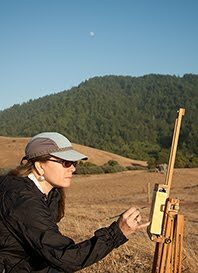 Because Kit and Gary were there, it really was their family business and "home", much like the feeling I have in Marin when visiting a family farm and meeting Mickey Murch and his family at Gospel Flat Farm in Bolinas, or Liz Daniels and her husband out at Cow Track Ranch in Nicasio. Kit and Gary have created something intimate with this spot. Like these local, Marin Organic producers, Kit and Gary now have a Farm and CSA Program for organic and local produce. Their farm, just 7 miles further up Howell Mt. road from where I biked, has certified organic fruits, herbs, and vegetables, including tomatoes, peppers, squash, apples, plums, garlic, potatoes, broccoli, kale, chard, greens, onions and more. 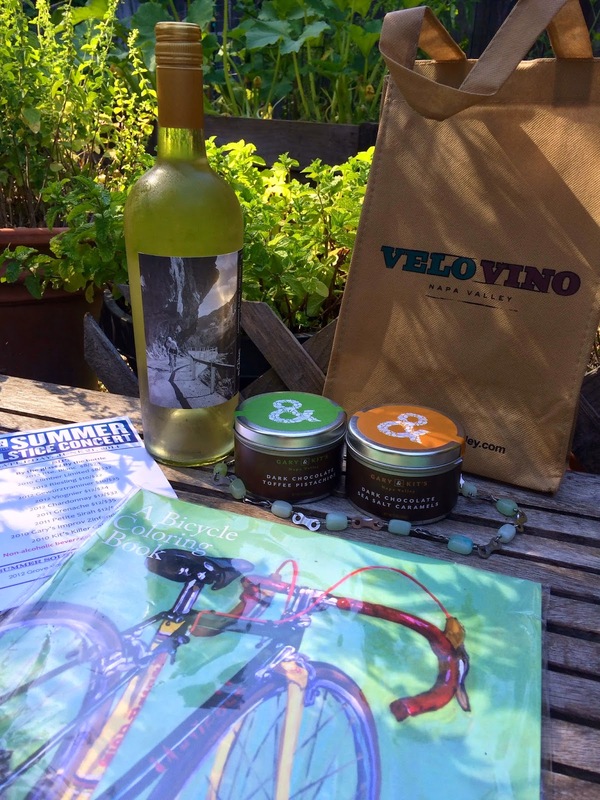 CSA (Community Supported Agriculture) Members may pick up their weekly box at Velo Vino every Tuesday, May through October. CSA members also receive 20% off wine and food in the tasting room. When it was time to go, I didn't really want to leave. I bought lots of gifts to bring home, including a cycling necklace and Bicycle Coloring Book with art by Taliah Lempert. A very nice woman invited me to someone's house to continue the evening fun, but I declined, realizing I had a fairly long drive back to Marin. Kit was very kind to offer me coffee when I mentioned that I had to drive. Again, the sense that they are local producers and not a corporation came through with her kind offer. I left feeling really happy, positive and believing in these wonderful people. Yes, I would love to work for Clif Bar, now so more than ever, and.... 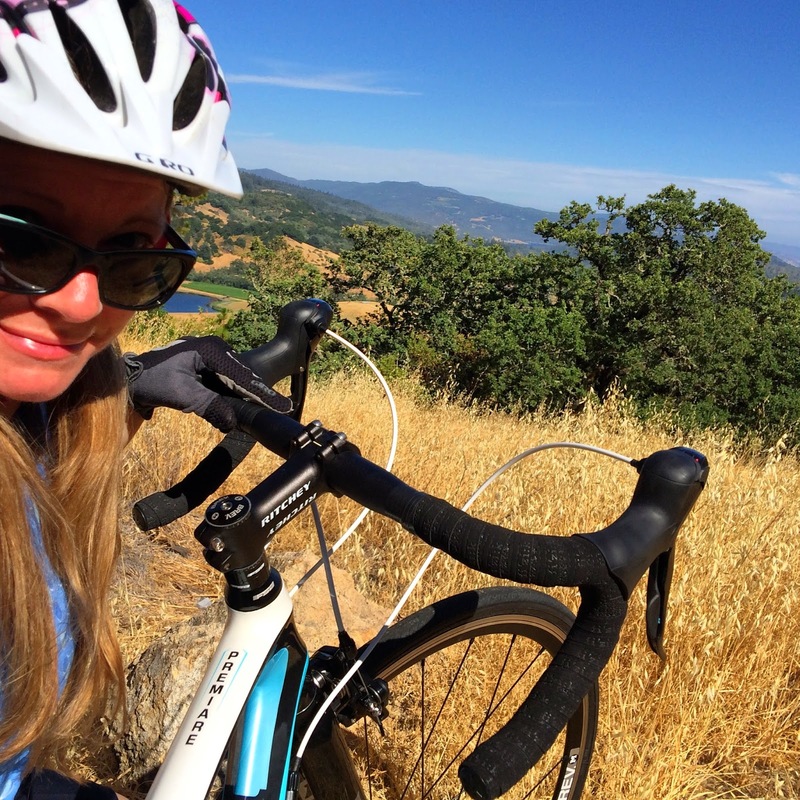 I can't wait to bring some friends out to Napa and share a ride and this cyclist's respite with them. Grazie, Velo Vino! Until we ride again.